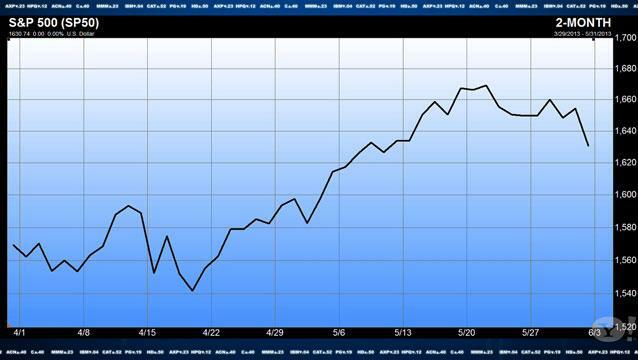 Markets are trying to find their footing after a rough closing last week capped off an otherwise strong May. The choppy price action for both the Dow Jones Industrial Average (^DJI) and the S&P 500 (^SPX) is making the sidelines look appealing to those sitting on large gains for 2013. Adding to concerns was last week's triggering of the "Hindenburg Omen," regarded as a precursor to market crashes by the more superstitious traders on Wall Street. What's a Hindenburg Omen? There are two decent answers. The first is the technical definition: The Omen is triggered when: (1) more than 2.2% of stocks on the NYSE are at 52-week highs AND more than 2.2% are at 52-week lows, (2) the 50-day moving average is trending higher, (3) the McClellan Oscillator is negative, and (4) new 52-week highs don't exceed new lows by more than 100%. When that happens twice within 36 trading days the Omen is triggered. All four conditions were met on April 15th, metaphorically lifting an enormous bag of Nazi-sponsored hydrogen over the stock market. To devotees of the Hindenburg Omen Friday's close was a static electricity spark over Lakehurst New Jersey. Now we can only sit back and watch the stock market burn. Oh, the humanity indeed. An alternative explanation is that the Hindenburg Omen is BS. Supporting the latter argument is the fact that the inventor of the Omen received wide attention when he sold all his stocks in the last week of August 2010, immediately prior to the 25% rally over the next 6 months. Do your own additional research on combustable Nazi blimp indicators if that's your thing. As for Raymond James' Jeff Saut, he's a seller of splashy Omens and a buyer of U.S. stocks despite other signs of wobbling in the aging bull market. "What you did was pulled back to the point that the latest rally started on the 14th of May," Saut assures viewers in the attached clip. The launch point for that move was just above 1,630 on May 13th. From there stocks ramped to all-time highs at 1,686; a move that was given back last week. With stocks now "about as oversold" as they can get, Saut suggests it's time to load the boat. "I think dips are for buying. I think stocks trade higher into the end of the quarter as the under-invested portfolio managers chase the performance derby, and the first point of real vulnerability comes in mid-July." June doesn't always "swoon" and selling in May did nothing to help performance this year. There isn't a mnemonic, catch phrase, or analogy of any use when it comes to managing your portfolio. The Hindenburg Omen made for nice conversation last weekend but that's about it. For Saut to be knocked out of his bullish stance, it's going to take a Black Swan or highly unusual event such as crude oil doubling, or a "huge policy mistake" out of DC. Until then he's going to ignore the slogans and stay long equities.